Description: Front Squats are a variant of the traditional squat exercise, but the center of gravity is changed. This exercise makes you use the muscles of the upper back and shoulders along with your legs. 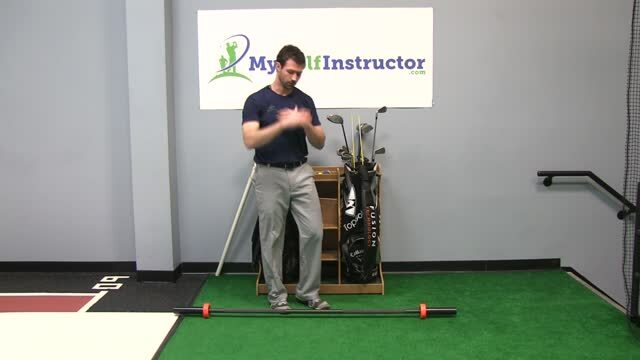 It is a great exercise for posture and trunk control during your golf swing. For this exercise I recommend you start with no weight at first and see how you do. Then you can add a barbell and gradually increase weight. Begin by standing straight with your feet about hip width or slightly wider and your toes pointing out a bit. Next, extend your arms straight out in front of you and curl them so that your hands are placed on the front of your shoulders. If you are holding a barbell your hands will be facing the ceiling. Your elbows should be pointing straight forward in front of you. Squat down by bending your knees and hips until your thighs are past parallel to the ground if you can go that far. Keep your back straight and keep facing forward. Allow your knees to extend in the direction of your toes. Push yourself back up into your starting position by straightening your legs and then begin again. Slowly lower yourself down to the count of 3, pause and then extend up to the count of one. Begin with 3 sets of 8-10 repetitions and then as you get stronger week to week try increasing your weight.